One of the core principles we hold to at Relevance is the idea that we should always be striving to get better. A big part of that is recognizing that we can learn a lot from others, especially when those others have the same attitudes about continuous improvement. That's certainly true at Bendyworks, which is why we were happy to do a Craftsman Swap with them recently, where we sent them Jared Pace for a week, and they sent us Chris Wilson. On this episode, we talk to Jared and Chris and their pair partners Alan Dipert and Devin Walters about that experience. We also talked about accidentally taking the ferry and whether exposure to radioactivity makes you better at using project management tools. 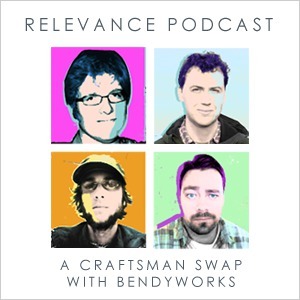 It was a fun and interesting conversation that made me want to try a Craftsman Swap myself! Perhaps you'll feel the same. If so, give us a shout - we'd love to spend some time learning from you! And I know the same goes for Bendyworks.